Autumn is in the air, can you feel it? I am starting to get super excited for the fun the season brings! Crunchy leaves, brisk air and that wonderful harvest of food! One of the best harvests is apples. To me, besides pumpkins, apples really say “Autumn” and one of the best ways to welcome the harvest is to go to an orchard and pick your own as a family activity. 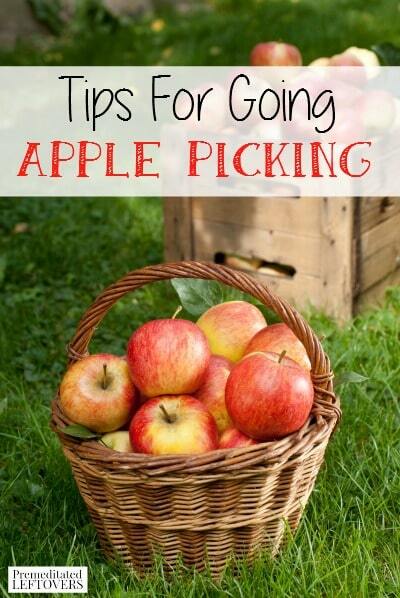 Here are some tips for making your apple picking trip a success! Decide on a plan for using the apples before you go. The last thing you want is a bunch of apples that will be wasted because you won't be able to use them all in time. Decide on an estimated amount of pounds to pick and choose some recipes beforehand. If you think you may get too many, anyway, have some people in mind who would love to share your harvest. Make room for your bounty before you leave. Apples will stay best in a cool and dry environment. Make sure you have room for them! Call around and visit websites. Many orchards only have certain times, days or dates that they allow the general public to come and pick. Sometimes, this is all in one weekend or week while the community holds a harvest festival. Make sure you know when you are allowed to go before you head out so you can plan accordingly. Also, make sure you don't need to make an appointment as well. This is also a good time to inquire about the varieties the farm produces and if they have any dwarf trees that little ones can pick from without a ladder. Ask the farmer what to look for when choosing ripe apples. Many different varieties lend to many different things to look out for. Color is not always a good indicator as sometimes the apples are a light color to begin with. No matter what the variety, though, inspect for signs of bugs (especially in organic orchards) or bruising. Be careful with your pickings. Don't toss them carelessly into baskets or containers. Apples bruise easily and when they do, they start to go bad pretty fast. Instead, work as a team to have one person place the apples gently in the container. This is a perfect job for kids! Pick the apple the correct way to avoid bruising and dropping it. Place your hand firmly on the bottom of the apple and twist at the stem. Wear sunscreen and protective clothing. This is not the time for a fashion show. Make sure to ear a wide brimmed hat and clothes you can get dirty in. Put on plenty of sunscreen as well. Just because it is fall doe snot mean the sun is no longer damaging. When you get home, don't wash your apples. This will only speed up the process of them turning. Unless you plan to use them right away, there is no need to even rinse them off. Just leave them in the cool, dark place you made for them and they should last several weeks. Have you ever gone picking at a local orchard? I would love to hear about your adventures! What did you make with all those apples?